Bees are not only essential to the environment (60% of food plants depend on honey bees for pollination) but these highly sophisticated insects are also a real pleasure to keep. This one day course is a complete introduction, giving you a taste of what is involved and helping you to understand the whole beekeeping process before you fully commit to keeping bees yourself. Age: We would advise that this course is only suitable people aged 12 years and over. Under 16s must be accompanied by an adult. We put these guidelines in place for the safety, comfort and enjoyment of all our guests. Apiary Visit:The course includes a visit to our apiary. However, this will be weather permitting. 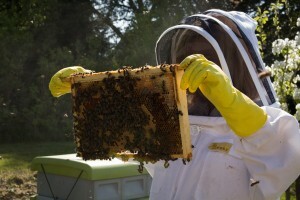 If the weather is not suitable then the the course will use a simulated hive so that the same concepts can be taught. Bee suits and gloves will be provided but it is recommended that you bring wellington boots or similar footwear.